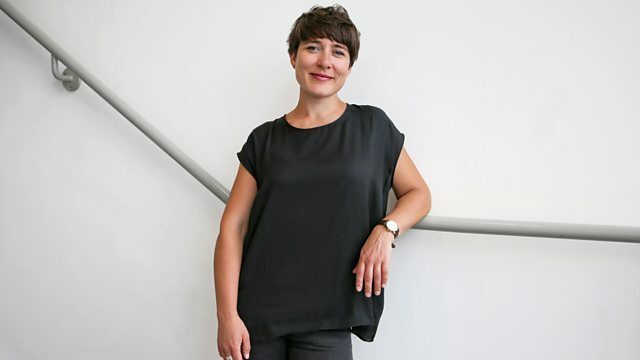 Kate Molleson introduces music by Philip Venables, Lee Hyla and Helga Arias Parra performed by the Riot Ensemble, and Wolfgang von Schweinitz played by the Goeyvaerts Trio. Kate Molleson introduces music performed by the Riot Ensemble and recorded last month at Kings Place London. Lee Hyla’s raucous We Speak Etruscan is a piece that imagines a new (fake) language, spoken by a heavily amplified bass clarinet and baritone sax; Helga Arias Parra’s meditative Incipit is derived from a quote of Pergolesi which only emerges in its dying moments; and Sarah Nemstov’s Central Park sits alongside Venable’s numbers 91-95, a setting of words Simon Howard. Also, music recorded at the Book of Hours Festival in Co. Louth during the summer. Wolfgang von Schweinitz's KLANG is a hallucinatory work for string trio and ring modulator performed by Flemish (string trio) Goeyvaerts Trio. Ensemble: Riot Ensemble. Conductor: Aaron Holloway-Nahum. Ensemble: The Riot Ensemble. Conductor: Aaron Holloway-Nahum. Performer: Gavin Bryars. Ensemble: Louth Contemporary Music Society. Ensemble: Music Generation Louth.